Arriving this Wednesday at Sports Cards Plus is 2017 Bowman Draft Jumbo ($124.95 with 384 cards and 3 Autos per box) and SUPER JUMBO ($209.95 with 600 cards and 5 Autos per box). Top Autographed Draft Picks include Royce Lewis, Hunter Greene, Mackenzie Gore, Brendan Mckay, Kyle Wright, Austin Beck, Pavin Smith, Adam Haseley, Keston Hiura, Jordon Adell, Jake Burger, Shane Baz, Trvor Rogers, Nick Pratto, Clarke Schmidt, Evan White, Alex Faedo, Heliot Ramos, David Peterson, D.L. Hall, Logan Warmoth, Tanner Houck, Babba Thompson, Nate Peterson and much more. Like 2017 Bowman, Draft packs come with both regular Bowman and Bowman Chrome cards. The matching base sets have 200 cards highlighting both 2017 draft picks and other prospects. Regular Bowman parallels include Silver, Purple, Blue, Green Gold, Orange (/25, Jumbo-only), Red (/5) and Black (1/1). All of these are serial numbered. Bowman Chrome base cards come with multiple levels of Refractor versions that can be discerned by their colorful reflective backgrounds. In addition to base Refractors are numbered Purple Refractor, Bowman 70th Logo Refractors, Blue Refractors, Green Refractors, Gold Refractors, Red Refractors (/5) and Superfractors (1/1). There are also Sky Blue and Orange (/25) Refractors that are exclusive to regular Jumbo Boxes and not Super Jumbo. Select cards also have Image Variations that switch out the photo. Of there, some have autographed versions that are numbered and come with an on-card signature. 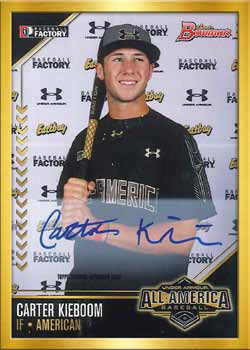 Chrome Draft Pick Autographs are one of the main reasons a lot of collectors chase Bowman Draft each year. The 2017 draft class makes their MLB autograph debuts with on-card signatures. There are more than 70 Bowman Chrome autographs on the checklist including first overall pick, Royce Lewis. The biggest name that isn’t in 2017 Bowman Draft Baseball is Hunter Greene. 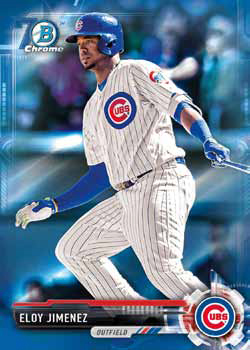 Topps has confirmed he will appear in 2018 Bowman Baseball, including autographs. The parallel rainbow includes Refractors, Purple Refractors, Blue Refractors, Green Refractors, Bowman 70th Logo Refractors, Wave Refractors, Gold Refractors (/50), Orange Refractors (/25), Red Refractors (/5), and Superfractors (1/1). Orange Refractors are exclusive to Jumbo and are not in Super Jumbo. Black Refractors (/75) are also available but only in special Jumbo Box hot packs. Super Jumbo boxes don’t have hot packs. Class of 2017 Autographs are case hits in both Jumbo and Super Jumbo. The checklist for these is limited to first round picks from the 2017 draft. All-America Game Autographs return. These were signed while the players were still in high school and took part in the special showcase. In some instances, these could have been signed several years prior and have sat in the Topps vaults ever since. Gold Framed parallels are one-of-ones. 2017 Bowman Draft has a few additional inserts. MLB Draft History highlights retired players, looking at the early portion of their pro careers. Autographed versions of select cards are numbered no higher than 99. This checklist includes autographs of Derek Jeter. Bowman Defining Moments and Recommended Viewing are a pair of new insert themes. Defining Moments look at the specifics behind prospects’ success. Recommended Viewing pairs up prospects from the same franchise. All three regular inserts come with four levels of parallels, all of which are numbered: Refractors, Gold Refractors (/50), Red Refractors (/5), and Superfractors (1/1). Jumbo Boxes also have Top of the Class box topper cards. These over-sized Chrome cards are numbered. Players are limited to 2017 draft picks. Parallels come in the form of Gold Refractors (/50), Red Refractors (/5) and Superfractors (1/1). Select cards have Autographed Orange versions as well. Comparing 2017 Bowman Draft Jumbo and Super Jumbo Boxes, the majority of the cards are the same but the Super Jumbo Boxes have a few exclusives.